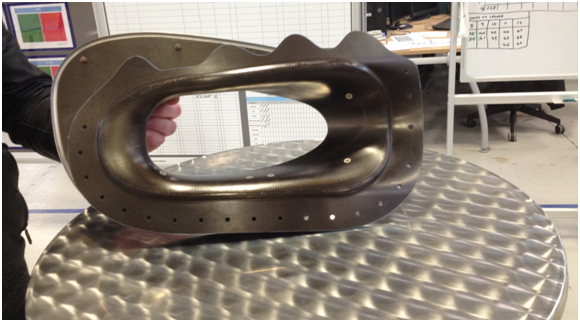 Innovative thinking from NWAA Members Safran Nacelle Manufacturing Manager Andy Crosland and FDM Digital’s Technical Director Graeme Bond solves Airbus rate production problem using 3D printing technology. “When we began the A320neo journey our vision was firmly set on the future production rates. A clear objective for this was to ensure that we error proofed every operation.One of the early problems we encountered was accurate drilling and countersinking of the Pre-cooler Scoop to the IFS panel. The standard process is to countersink a hole using a “Vanmar Microstop Cutter Cage”, this tool sits flat on the surface of the component when being used. However, the Pre-cooler Scoop has a complex 3D curved surface so the Vanmar would not sit flat, thus causing a problem for the operator. The results were that sometimes the countersinks would be too shallow or too deep, or not at the correct angle and the operation was so risky that only one operator would voluntarily carry it out. I myself have a passion for innovation and I decided we needed a more creative approach to the solution. An idea came to me that we could 3D print a new drill guide alignment end for the Vanmar with the 3D curvature of the Pre-cooler built in. I had recently visited FDM Digital Solutions and met Technical Director Graeme Bond, who has a background in jig and tool design, we arranged to meet and together we came up with a conceptual idea that allowed a repeatable production solution. Collaboratively we designed a 3D printed shroud that covers the whole of the Pre-cooler aperture and at each countersink position there is a recess for the Vanmar to be aligned at the correct drill angle allowing a repeatable drill and countersink operation to be done at once. FDM Digital Solutions engaged with multiple two-way visits engaging shop floor production operatives with 3D printing technology. “Through various tests and tool trials, together we found the optimum solution for Safran Nacelle’s problem. Educating and engaging the team at Safran Nacelles in the approach of design and manufacturing freedoms using 3D printing, and being ready to accept a technology to change traditional manufacturing techniques, was key to the success of this production solution.